It’s important to learn from experience; from previous projects and our surroundings, when working in the areas of urbanism and planning. It turns out people thrive best where there’s a great mix of function, extensive pedestrian and bicycle transportation, a minimal number of cars at street level and an understandable hierarchy of private, semi-private and public spaces of high quality. Today’s new suburbs and neighborhoods mostly consist of parking lots, roads and buildings without soul or purpose. Towns and cities have become industrial parks and machines lacking spatial and material quality, except in prestige projects. How did we let this happen to such a great extent? That’s why it’s important for city planners and architects to engage each other more—not only on prestige projects, but every time something is built. I’m Ivar Lunde, a partner in L2 Architects AS. I was born in Oslo in 1957 and have a masters degree in Architecture from NTNU University in Trondheim. Ever since I was little, I’ve been interested in shapes and geography. Countries, cities, buildings, furniture, cars and aeroplanes—everything that has a shape, and ha been shaped by man, had my interest from very early on. I chose to work in architecture because I saw so many possibilities in the field. To be able to create something beautiful and interesting together with a team was the driving force and the joy for me—and it still is. L2 Architects was established in 1986. We deliver both large and small scale projects. Everything from architectural studies and city planning, to large buildings and bridges. L2 was commissioned for a number of important projects, such as the Tønsberg library, The Norwegian PetroleumMuseum in Stavanger, The University of Kristiansand, the Government Park, Greenland Bridge and Lørenskog Culture Centre. 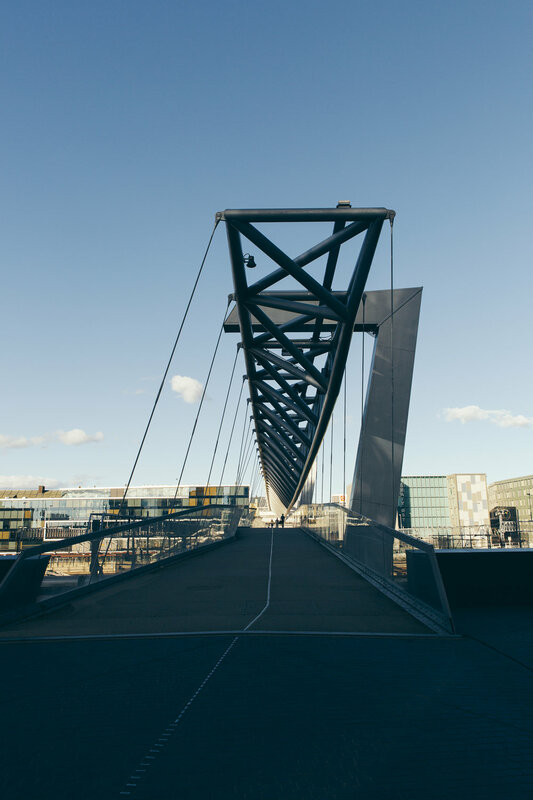 Over the past 30 years we’ve received several significant awards, including the international steel prize for the pedestrian and bicycle bridge Akrobaten (the acrobat). Spanning nineteen electrified railway tracks at Oslo Central Station, the bridge acts as a link between old and new districts of Oslo, but also has stairs and lifts down to the station platforms. The main challenge of the project was that the bridge had to have sufficient clearance from the railway lines below, while allowing pedestrians and cyclists direct access from ground level on either side. In addition to this, there were only four possible foundation points, and the bridge therefore had to span a total of 67m between them. We based the resulting design on overcoming these challenges—lifting the primary construction over the walkway and creating a visually spectacular form. Four steel columns, shaped like a number seven, hold up a 5m-deep triangular steel truss that’s tapered at both ends. The walkway hangs from this truss by a series of thin steel rods. The bridge is sided by a large glass railing that affords its users a clear and unobstructed view of the city in both directions. I want to rediscover our amazing European urban tradition, while giving cities a modern-day signature of our time. Look at what the Oslo Opera, by Snøhetta, has done for us: a building to be proud of, a new space housing the opera and the ballet inside, with a new location by the bay and the city outside. What is urbanism to you? It is to create or contribute towards sustainable environments and surroundings for people in cities. An overall plan, but also a single building or a bridge that is part of a city as a whole. It’s important to always keep your eyes open—to see what we can do better, how we can make our surroundings even more beautiful and functional.